To see what I mean, have a look at the following page from an official IELTS Listening test, and think about why I circled or underlined the words ‘grade‘, ‘cancelled‘ and ‘advise against‘. I underlined ‘grade‘ so that I remembered to listen for a grade such as ‘A‘ or ‘B‘ without having to read the whole question again. I underlined ‘cancelled‘ and wrote ‘what?‘ so that I remembered to listen for something that has been cancelled. I circled ‘advise against‘ to remind myself to listen for a book that Dina doesn’t recommend. While listening, if you know you’ve missed a question, put a line through the question to help you keep track of where the recording is up to without having to read the questions again. 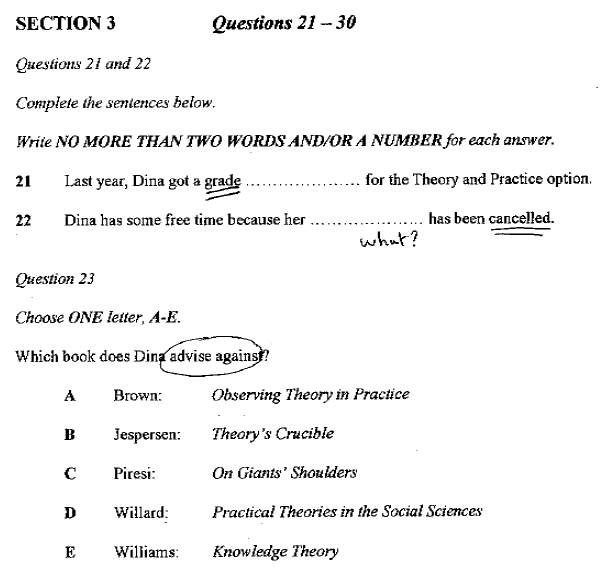 To show you what I mean, here’s what I would have done on the question paper above if I knew I had missed question 21. Next time you practise an IELTS Listening test, try these two IELTS Listening tips and let me know if they helped you listen and read at the same time. Very helpful for a distance learner. I’m glad you found the post useful, Hasnat.